One New Year resolution that will have definitely crossed the minds of most people lately is buying a home. The question, however, is whether they will actually get around to it. Real estate is quickly becoming one of the best forms of investment, with almost guaranteed returns on investment. If recent trends are anything to go by, property values are only set to increase from here on. Over the past year, many government reforms and developmental trends have made the predictions for 2018 seem extremely positive. This means that for all aspiring homeowners and real estate investors, the best time to buy a home or invest in real estate is now. 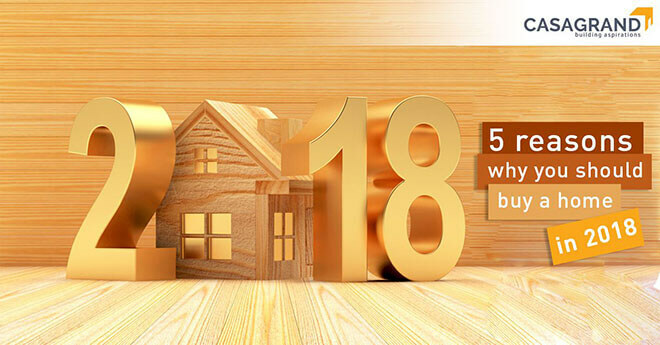 Here are five reasons why you should buy a home in 2018. The prices of property on the market have never been better than they are now. Properties in most areas (particularly in suburban parts) have seen a rise in buyers due to the low prices offered. This is happening partly due to the introduction of the CLSS Scheme by the Ministry of Housing and Urban Poverty Alleviation last year. The CLSS Scheme (part of the PMAY initiative) makes it possible for members of the Lower and Middle Income Groups to apply for subsidies on housing loans when buying a home. If a home loan is sanctioned or processed after January 1, 2017, applicants under the scheme can make use of major subsidies on interest payable. To know more about it, read our blog on All You Need to Know About the CLSS Scheme. The usage of modern technology in developing properties has changed the real estate development process for the better. Virtual Reality (VR) technology, for instance, lets potential homebuyers take a full tour of a model apartment without having to physically visit the site. This has opened the doors for more NRI investors since they can experience the property for themselves without ever having to visit. The introduction of Smart Homes equipped with the latest technology also makes life hassle-free for residents. Almost everything in these homes can be controlled by the touch of a button, making them attractive to potential homebuyers. Technology has changed the real estate industry for the better and this is expected to be a key reason for the growth in this sector. The introduction of the Real Estate Regulatory Act (RERA) has helped the real estate industry take a step further towards transparency in the market. New rules regarding residential and commercial projects have been introduced along with reforms for finance. These changes have ensured that buyers in the current real estate market are sufficiently protected from fraudulent claims. With the introduction of this Act, aspiring homebuyers can invest in real estate without any worries. To know more about RERA, read our blog on The Real Estate Regulatory Act – Revolutionizing the Indian real estate sector. Most upcoming developments are located in areas that have recently seen a rise in interest from real estate buyers and sellers alike. These areas are located in close proximity to the cities and various places of interest. The market rates of the properties in these areas are also very affordable, putting them within the reach of aspiring homeowners. With prime locations being available for incredible prices, this is definitely a sign that you should buy a home during this year. Most of the residential developments and townships now come with a variety of amenities for residents. Most of these amenities include swimming pools, gymnasiums, clubhouses and small parks, to name a few. These amenities offer a life of unmatched luxury and convenience for every resident. As older apartments within the city do not offer any such features, erstwhile tenants are now looking to invest in newer real estate projects. Many such residential apartments are now on the market and are ready to be occupied by home buyers looking for a better home to live in. These five factors have contributed enormously to the current state of the real estate market. Real estate has become a buyer’s market in 2018, making it the perfect time to invest in a home. While buying your dream home, be sure to invest in reputed brand names in real estate such as Casagrand. Casagrand is one of the top builders in India, with high-quality residential properties available for occupancy across the country.